It was five years ago today that my biopsy results were delivered: It’s prostate cancer. 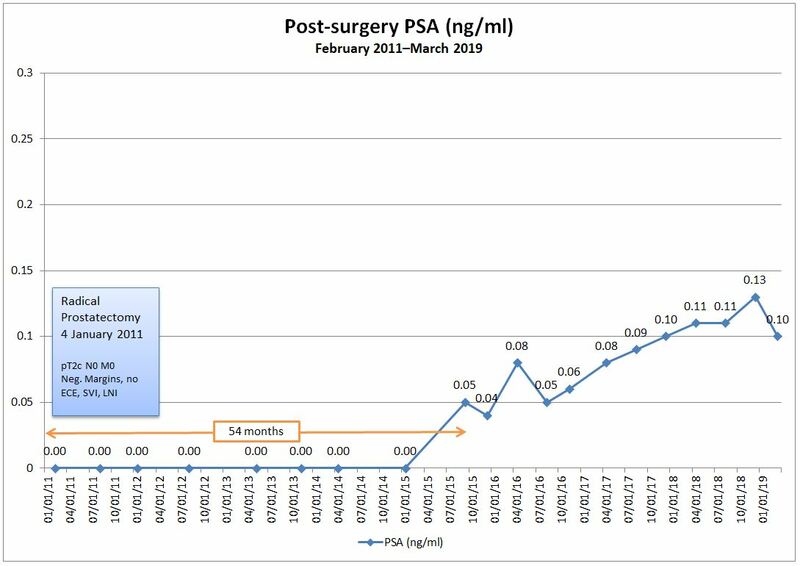 Five years later, I’m back in the waiting-and-wondering mode as I wait as patiently as I can for my next PSA test to see if my September PSA reading of 0.05 ng/ml was a fluke (readings for the previous four years always came back undetectable), or if it’s the beginning of an upward trend and a trip to recurrence. I plan to have my blood drawn on 2 December and should be able to get my results online 3-5 business days later. My appointment with my urologist is on 15 December. On the whole, I’ve been doing pretty well emotionally. I’ve put this onto the back burner for now, but I’m finding that, as I get closer to the blood draw (it’s just three weeks away), I’m becoming a tad more moody. There are days where I’m doing quite well, and there are days where I simply think, “I really don’t want to go through this again.” In the interim, I have been reading about recurrence and treatment options to get myself a little smarter about it all. With luck, I won’t have to put that research to use. With all of the coughing, I returned to my incontinence pads as insurance, and they were definitely needed some days. I will say, however, I’ve continued my weight loss program, and being 67 lbs. /30 kg lighter, has really helped decrease the severity of the stress incontinence. It would have been far worse had I had this cold a year ago. I attended my first prostate cancer support group last night at the San Diego LGBT Center. It’s something I’ve been meaning to do since September, but life kept throwing me curve balls. Even five years into this adventure, there definitely was value in hearing perspectives of other guys. I’m glad I attended. Finally, you would have thought that after five years of blogging, I’d be better connected in the blogging community. Let’s just say that I’m apparently a slow learner and it’s only been in the last few months that I’ve discovered how to open doors to other bloggers. A few weeks ago, I came across Mansacked: A Blog About Prostate Cancer written by a gentleman five months into his experience with prostate cancer. He, too, has been very open in his discussion which, to me, is very important. Check it out. Thanks, Phil. I’ll post the news as soon as I have the results.